Lincolnshire is a county in the east of England. It borders Norfolk, Cambridgeshire, Rutland, Leicestershire, Nottinghamshire, South Yorkshire, and the East Riding of Yorkshire. It also borders Northamptonshire for just 19 metres (20 yards), England's shortest county boundary. The county town is the city of Lincoln, where the county council has its headquarters. The ceremonial county of Lincolnshire is composed of the non-metropolitan county of Lincolnshire and the area covered by the unitary authorities of North Lincolnshire and North-East Lincolnshire. The county is the second largest of the English counties and one that is predominantly agricultural in land use. The county can be broken down into a number of geographical sub-regions including: the Lincolnshire Fens (south Lincolnshire), the Carrs (similar to the Fens but in north Lincolnshire), the Lincolnshire Wolds, and the industrial Humber Estuary and North Sea coast around Grimsby and Scunthorpe. 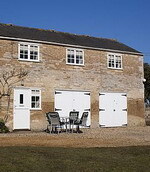 In the grounds of 18th Century Watermill and Main House, This Coach House has an Idyllic setting with spectacular views. The river runs into a large Mill Pond, private fishing in unfished waters both in the Mill pond and the river, with Chub, Pike, Perch and Carp in abundance. Birdlife is spectacular from Kingfishers to Owls and kites. Dog walkers are welcome with plenty of walks to chose from. Dog sitting also provided if you want a day out without them. Comfortable, quality accommodation. On the ground Floor wc and well fitted kitchen, on the first floor one Main Bedroom with very spacious en suite/main Bathroom, Spacious Lounge with Dining area. Table and Chairs outside for dining in the summer months. Barbecue facilities available. Sleeps 3. 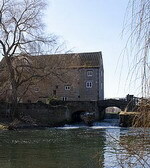 18th century converted watermill. Idyllic setting with spectacular views. The river runs into a large Mill Pond, private fishing in unfished waters both in the Mill pond and the river, with Chub, Pike, Perch and Carp in abundance. Birdlife is spectacular from Kingfishers to Owls and kites. The sound of running waters give an air of peaceful calm that outshines any spa. Dog walkers are welcome with plenty of walks to chose from. Dog sitting also provided if you want a day out without them. Paddocks available if you want to bring your horse. First class accomodation, 3 spacious Bedrooms all with televisions. One ensuite. Large luxurious family bathroom. Large lounge area, reading area and well equipped kitchen. Top floor is a recreational area and also houses a double sofa bed, again very spacious. Sleepsa 8. This well appointed, 3 bedroom house is at the end of a cul-de-sac, its decked garden is perfect for watching the river with its barges and wildlife. 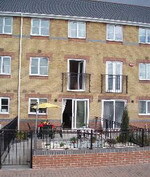 It is just a short walk from the town centre, weekly market and the new Marshalls Yard shopping centre. We have recently been inspected by the Tourist Board and awarded four stars. The house has full gas central heating and hot water, wired in fire detectors and a toilet on each floor. The price includes electricity, heating, hot water, bed linen and towels. Double bedroom, en-suite shower room with WC. Comfortable sitting room with DAB stereo, TV, DVD, video, digibox and has French doors overlooking the river. Double bedroom, bunkbed bedroom, bathroom with a shower over the bath and WC. Sleeps 6.